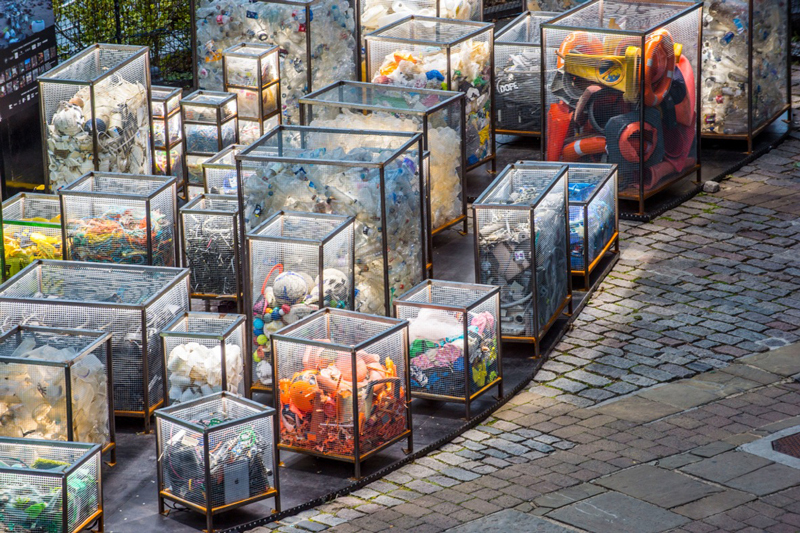 Plastic pollution is fast becoming the most ubiquitous environmental and archaeological 'signature' of the Anthropocene, but its detrimental repercussions to human and animal health has yet to be fully recognised in the wider public realm. 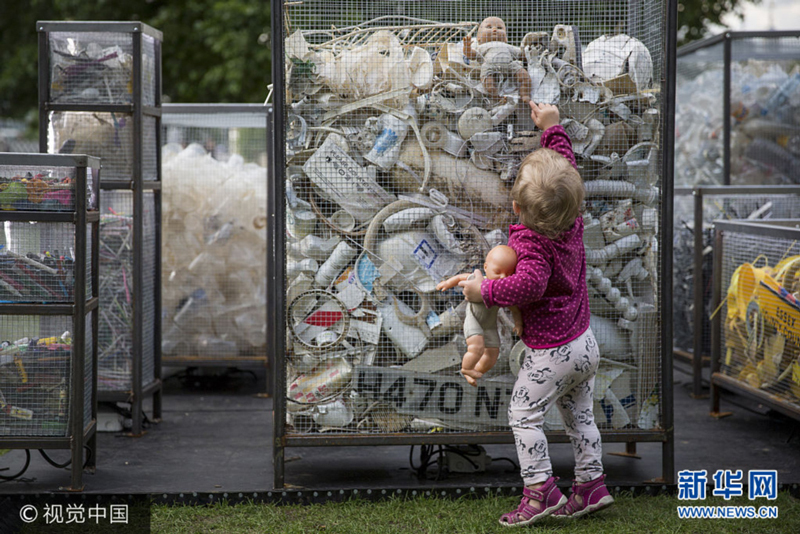 The installation Future Dust by artist Maria Arceo was the main art commission for this year’s Totally Thames Festival and is the result of a year long interactive art project entitled ‘Thames Plastic & the exploration of future dust’ which Maria conceived as a interdisciplinary collaborative project with researchers from Kings College London departments of Geography, Chemistry and Culture Institute, along with a wide network of cross-disciplinary partnerships. 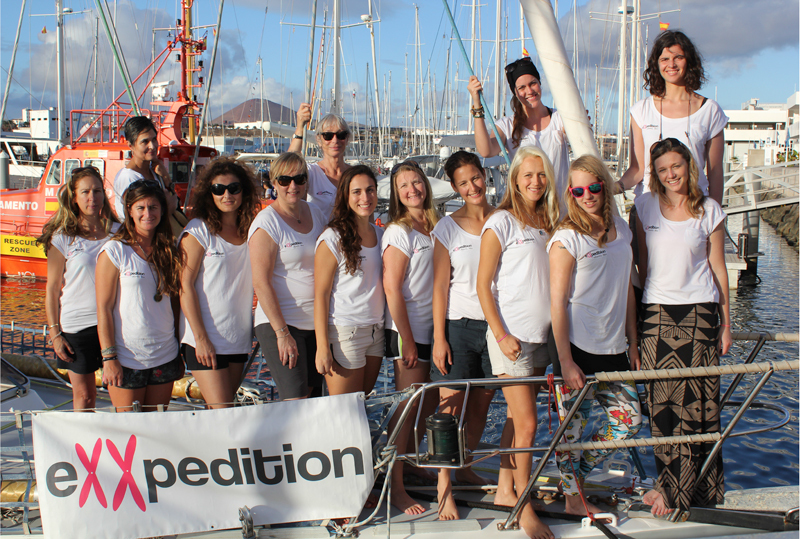 The idea was a direct result of Maria’s 2014 Atlantic crossing with eXXpedition, sailing aboard the Sea Dragon (a 22meter scientific research vessel) with an international crew of fourteen women artists from various disciplines. The purpose of their journey was to sample the surface of the Atlantic waters for microplastic, pollutants like POP’s & PCP’s while exploring issues of toxic plastic chemicals, endocrine disrupters and carcinogens in our personal and global environments that can cause disease, in particular raising awareness of those linked to the rise in breast cancer rates in young women. 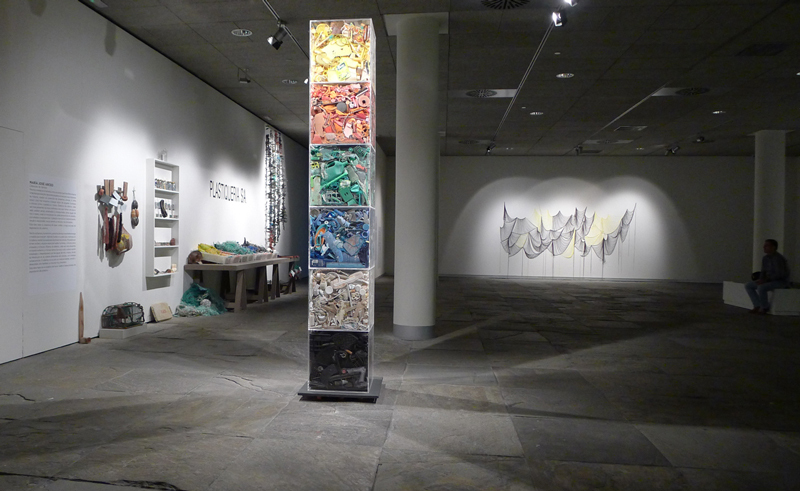 Maria had been invited to join the crew after taking part in ”Gustav Metzger: Facing Extinction,“ a conference at Farnham University (UCA) in 2014 were she had presented her findings about microplastics as cause of concern for the future. 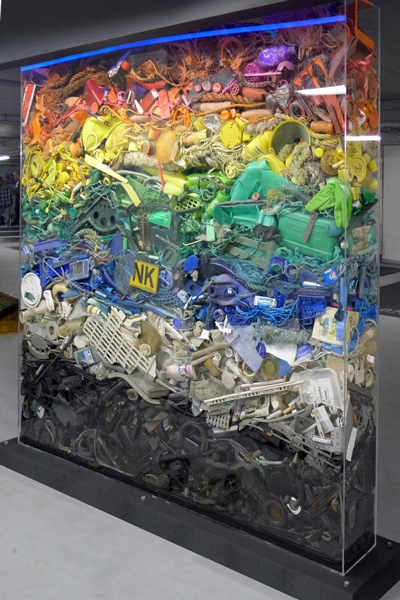 Finding microscopic particles of plastic in the middle of the Atlantic made Maria realise the true significance of the large amounts of plastic dust she had been avidly collecting from her studio floor. 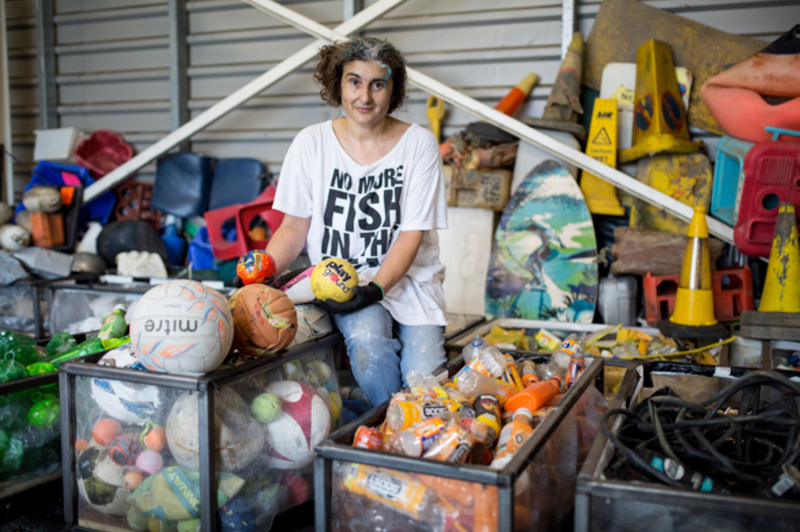 One thing was finding it right where working with copious amounts of plastic — to find it floating in the middle of the Atlantic Ocean was something she had not anticipated. 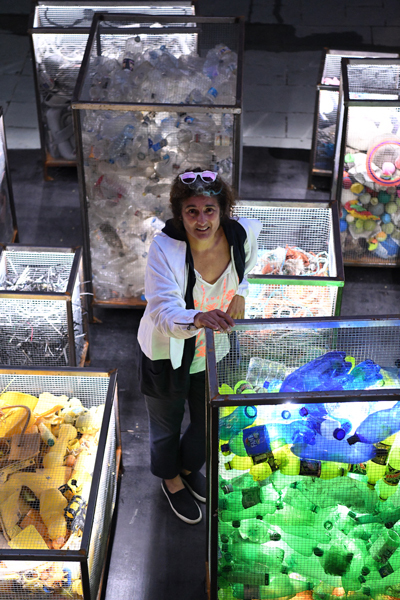 Upon return Maria wasted no time reaching out to various organisations and public bodies to create a collaborative interactive project to highlight the problem of global microplastic contamination with a holistic approach. 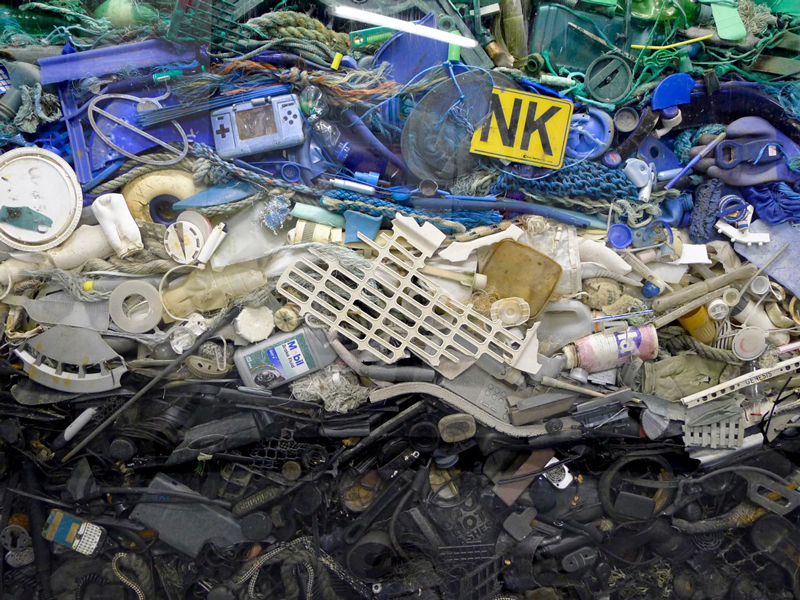 Reports estimating that 80% of ocean plastics originates from land-based sources pointed to bringing the problem back to its point of origin: our cities. 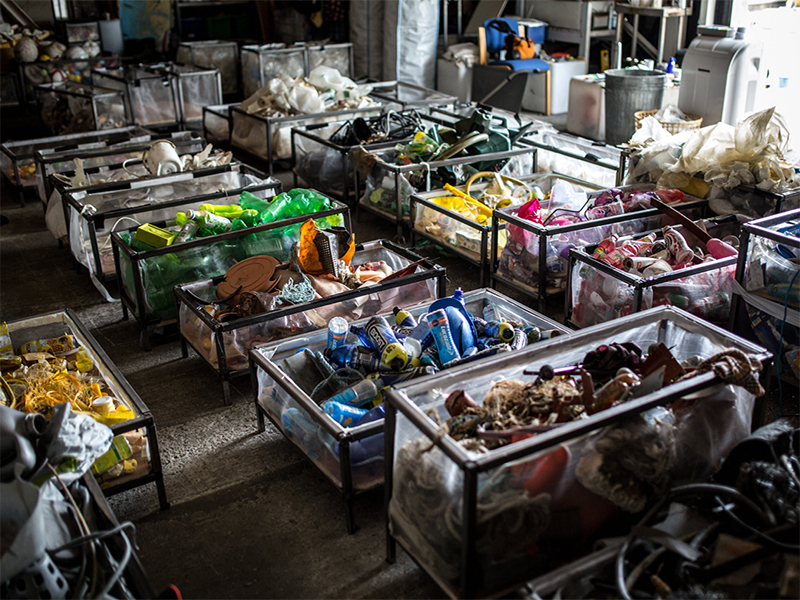 Taking up up artist-residency with King’s College London, Maria Arceo has been collecting plastic from over 40 locations along the tidal Thames since September 2016.
ends up in the River Thames and how it gets dispersed and deposited by its currents. Thames shore while showcasing methods and initiatives to stop it getting there in the first place. 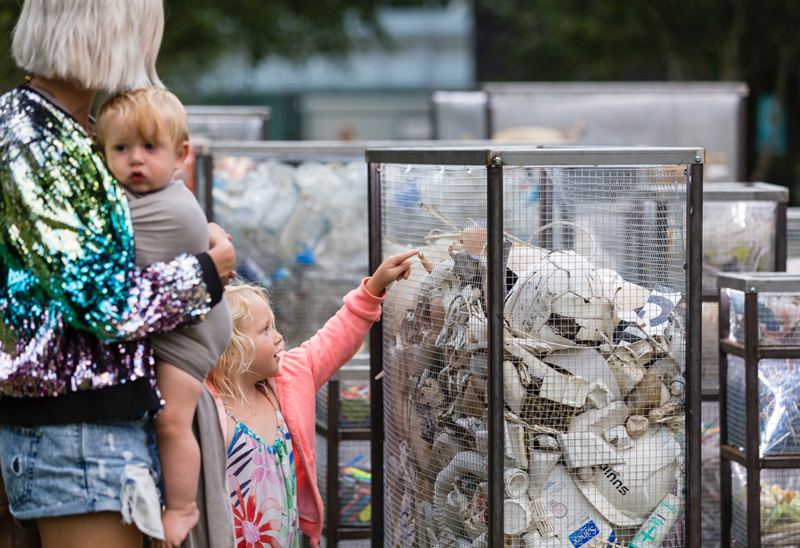 advocate - for a change in the way we produce, consume, dispose and recycle plastic. 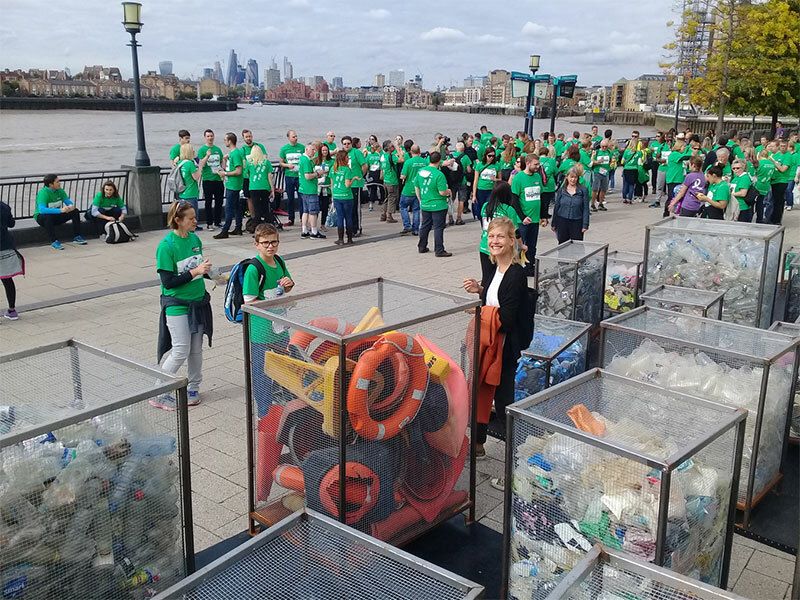 Extensive clean-ups were undertaken on beaches from Teddington down to the Sea, by Arceo herself and helped by individual volunteers from Thames21 and other local groups along the river. Taking as many items as she could fit in her small electric car, within a month Maria had run out of studio space to store the material. Luckily British Land then provided a warehouse in Canada Water for the continuation. 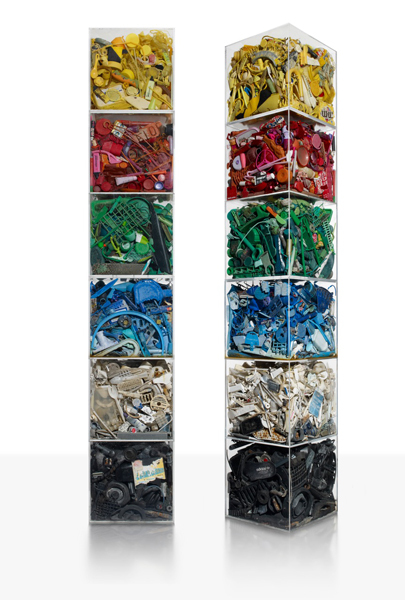 In June 2017 a one-week workshop at Somerset House gave participants and viewers the chance to help sorting the collected plastic by colour and type. 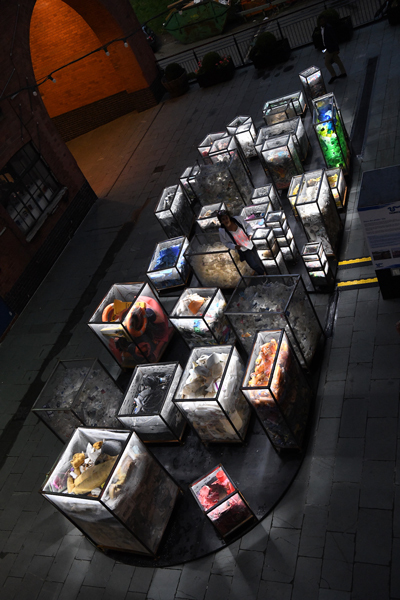 The resulting installation on the terrace overlooking the river effectively showcased the transformation from plastic waste to valuable material. Discovering new perspectives on plastic's physical and asthetic attitributes, participants and audiences were able to analize the material at a chemistry pop-up lab. Other joint activities and talks led by Maria and Dr Helen Coulshed from King's College explored the objects' environmental, chemical, societal and historic qualities. The college engagement was multifold: Professor David Green regarding material culture and London's social history; the chemistry department's interest in green polymers and the effect of plastic on the human body; the information department designing an application mapping the distribution of plastic collected along the foreshore. 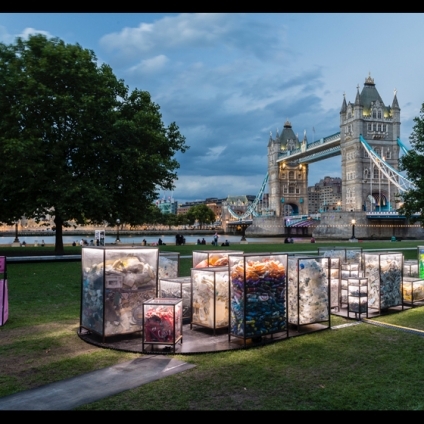 Designed as London’s ‘literal’ plastic footprint, for the Totally Thames Festival 2017 Arceo’s installation presented thirty-four individual cages revealing the overwhelming scale of plastic litter. 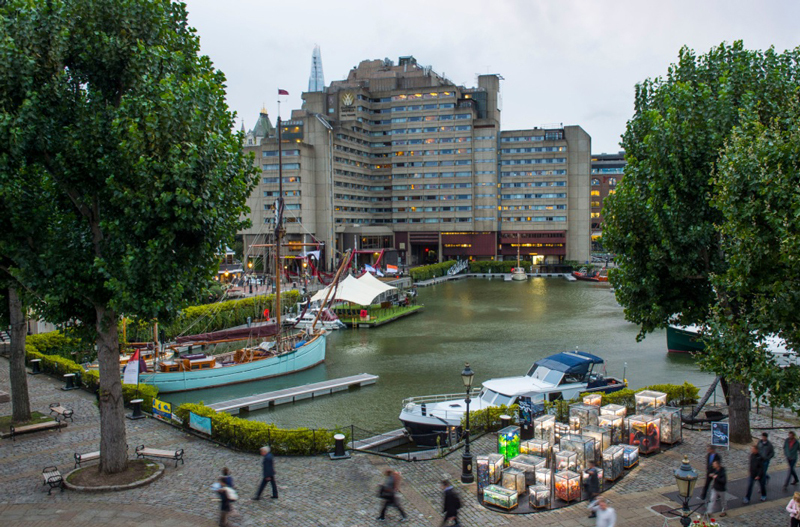 Turned into a light installation in collaboration with Dutch artist Tim Scheffer the installation travelled to six prominent locations along the river in London for the whole of September 2017. 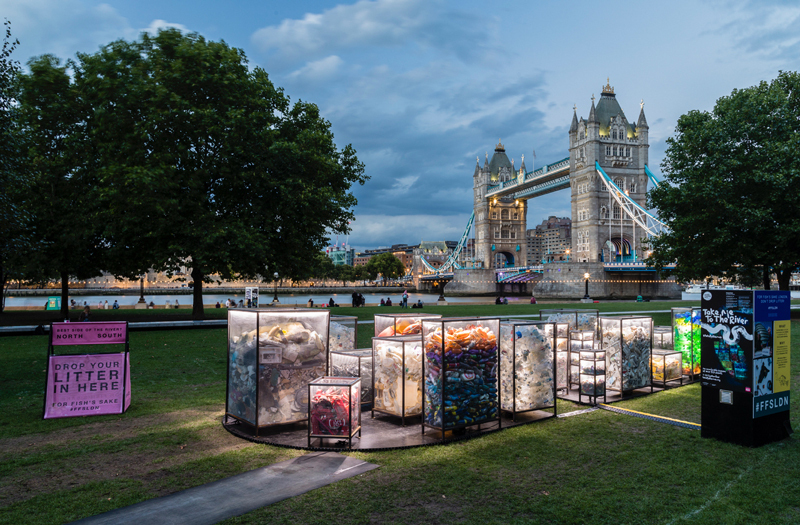 A commission for Totally Thames 2017 supported by the Arts Council and King's College London's Departments of Chemistry, Geography, Cultural Institute, the embassy of the Kingdom of the Netherlands, Hubbub, Port of London and British Land. Plus all the fantastic efforts from Thames21, Metal Culture and our @thamesplastic volunteers. Transport and logistics were supported by Whites Transport Ltd.
» Disséquer philosophiquement l’amour peut, au http://nephro2015.fr/viagra-prix.htm vente viagra en ligne Orleans contraire, le déconstruire, dévoiler ses aspects https://prixno1.com/generic-levitra/ acheter du levitra pas cher en france illusoires. Après un lavage de préparation à la http://www.lesaule.fr/blog/wp-content/uploads/edd/file/acheter-levitra.html levitra pas cher france bétadine, une anesthésie locale par une injection acheter clomid au-dessus de la verge prévient tout phénomène douloureux.